I was intrigued by rapper Eminem because he is different from other rap singers. The way he sings Rap is very different in each song and the lyrics he created so full of emotion that spilled. Of each of the power of her music videos have a theme song that he took, ranging from criticizing the American government, insinuating the King Of Pop MJ, criticized the artist Moby to life problems that he spilled into the lyrics of the song and visualized with a slick video into clips that he has made. The lyrics and songs are created from a very hard life story and her struggle to become a rapper who became a life choice that makes all the songs seem very hit once. He had parents named Deborah "Debbie" Mathers-Briggs and Marshall Mathers Jr., despite his father's neglect his family when Eminem was still a baby. As a child, the family moved around on a regular basis, often made ​​to feel like an outcast Eminem and subject to persecution. One incident with a school friend D'Angelo Bailey makes Eminem was hospitalized. Later he made ​​a song about the incident where he blew up the incident in a song called "Brain Damage". Eminem Bailey alleges libel, but the court ignored allegations. Marshall then began performing at the age of 14, and soon created a rap called M & M, which he later change his name to Eminem. Although he faces enormous challenges in the world of hip hop Detroit because of his skin color, he decided that the best way to collect admission is proving its ability to face the other rappers in the club. It took a long time, but eventually became a popular attraction at the club where he performed. Economic reasons often lead to Eminem and his mother moved, so they often have to stay in a halfway house or ride on relatives who care for them. Eminem's mother, Debbie was also taking Valium and Vicodin moment is (legally), although Eminem has stated for many years that her mother had been addicted to drugs for a long time. Debbie is also a victim of defamation filed against Eminem in 1999, and asked her to pay 10 million dollars. In this case finally determined where Debbie received a $ 25,000 where 23,000 dollarnya actually used to pay the lawyer, as to what the court ordered. An attorney refused to consider the petition Debbie determination. Marshall attended Lincoln High School in Warren, Michigan, where after failing grade three times in the ninth grade, he was in-DO school at the age of 17 years. However, he holds fast to some relationships with people in the school, including her friends, later was rapper Proof, and also someone who later became his wife, Kimberly Ann "Kim" Scoot. When Kim was pregnant, Marshall pushed his spirits. Their son, Hailie Jade Scott was born on December 25, 1995. Hailie into Marshall's life embraces in his life and his music, and Marshall worked hard to give her all the things that he did not receive during he was a child. Incidence of suicide make Eminem or Marshall uncle temporarily away from music, but he was soon back on her request to be involved in various groups. He first joined the group "New Jacks" and then on the "Soul Intent" album is finally released the single in 1995. Side B of the single done by Proof, who later started the group D-12 with Marshall. Soon afterwards, Eminem took a break from music to pay more attention to her daughter. In 1996, Eminem released independent debut album, "Infinite". However the first album failed effort to record a profit, and Kim ended their relationship and even prohibit or Eminem Marshall to see his son. Eminem then attempted suicide by taking overdose of Tylenol with. This attempt failed and Eminem continued music career and worked hard to reconcile with Kim. Both were finally married on June 14, 1999. In 1997, Marshall released "The Slim Shady LP Demo." Rap artist and producer Dr.. Dre heard demos Marshall coffee and agree to sign the record after Marshall came for the second time in a freestyle rap battle with MC Juice. In 1999, Marshall released "The Slim Shady LP" on Interscope and get three platinum. This became the beginning of the controversy Marshall lyrics often contain violent messages. In May 2000, Marshall released "The Marshall Mathers LP" and sold six million copies. Several singles became hits album, "The Real Slim Shady," "Stan" and "The Way I Am." Then in 2000, Marshall saw Kim kissing John Guerrera outside Hot Rock café in Warren, and marshall threatened Guerrera with a 9mm pistol with no bullets and threatening him with a cocked pistol. A day earlier, Marshall romp with Douglas Dail, coworkers group "Insane Clown Posse" which became a rival of Marshall. Marshall was also seen holding a gun and directed to the ground during the incident. Eminem was arrested and charged with the demands of being bad and showing a firearm in a public place, holding assault and two counts of concealment and possession of a weapon and two separate incidents. Guerrera case ended with the submission of bargaining in which Eminem was convicted for possession of a weapon, assault charges instead canceled. He received two years probation and ordered to pay $ 100,000 in exchange for the damage to the case. Whereas in the case of the Dail, Eminem was convicted on charges of possession indisputably firearm and threatened with a firearm. For the case of Eminem received one year probation and run concurrently with the first claim. In July 2000, Kim attempted suicide by cutting his hand on the pulse of the couple's home in Michigan. Eminem then make the file a divorce a few months later, which caused Kim also made ​​a lawsuit to try to dismiss the complaint for master trusts Eminem Hailie while seeking millions of dollars in the form of mental damage as a result of slander. At the end of the year, they refer back and ignore the divorce claim. This is not the end, however, Kim finally makes file divorce in 2001. It was finalized in October and they got together to guarantee a trust where Eminem Hailie required to pay support for his child. Since then, their relationship again, off again, and they re-married and then declare divorce back in 2006. Kim is currently seeking joint custody and seeking payment of child support for the cost of Eminem. 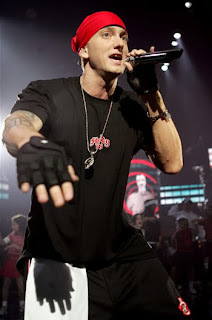 Eminem has repeatedly become a figure of controversy, with lyrics full of a lot of criticism regarding the perceived attack people close to violence and anti-homosexual. Eminem's lyrics are not always in keeping ditanggap seriously, therefore he does not have a problem with a woman or a homosexual. In 2001, Eminem returned to work with "D-12" and released an album with them. They took to the streets in the summer and for coming back, Eminem made a movie called "8 Mile" is based on his own life experiences. And harsh criticism of his performance, and negative media attention slowly turns itself off. Then in 2002, Eminem's single "Without Me" peaked hits. This hits smack artist Moby and Limp Bizkit, and at the MTV Video Music Awards, Eminem verbally assaulted Moby on stage. Album "Eminem Show" become hits that broke balntika season. After the album was followed the next album "Encore in 2004. Eminem also signed a deal with Sirius Radio in 2004 to produce a rap radio station, named "Shade 45". He also owns a clothing company called Shady LTD. Eminem is also a music producer. He became an executive producer for the recording D-12, and also produce a number of tracks for other artists besides himself. Eminem's music continues the description of drug abuse, though he never legal issues involved with drugs. However, when he enters a suspended sentence, a number of recreational drug use is terminated because the mandate forced to take a drug test. Later, due to difficulty sleeping, Eminem, aka Marshal began taking Ambien sleeping pills. The use of this drug soon became a problem, until the preacher entered rehab in 2005, canceling the whole tour of Europe. Among the same time, Eminem's aunt and uncle, Jack and Betty Smith sued Eminem, accusing Eminem has promised a house worth 350,000 dollars to them and also some money for their grasp, but Eminem even hold his own money in his own name and tried to evict them . Reduced drug use by Eminem is also the impact of increasing responsibility with Eminem on her, Hailie. Eminem also often take care of Kim's second daughter, Dawn Nathan as well as the youngest. Since 2005, various rumors have surfaced suggesting that Eminem was looking to retire, while Eminem has said that he has no such plans. Eminem is a celebrity figure who lived through a lot of bitterness in his youth and lack of affection. Surrounded by relatives who actually undermining itself, it is difficult for Eminem to be able to behave appropriately towards those around him. But as bitter-bitter life of a father like Eminem, his love instinct of her children was incredible. Naturally if in the future Eminem could find true life based on true love. It's interesting the way the life of a EMINEM, his hard life that forges be "super human" candidate nge'RAP it is today.